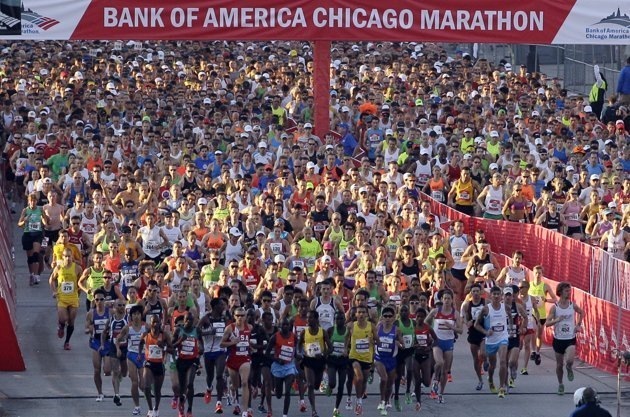 A lot of my friends & F’N Runners are currently in the midst of the heavy training miles for the 2012 Chicago Marathon. Everyone is hitting their miles and making amazing progress yet their confidence is not boosted with the completion of each long run. Instead they are filled with doubt. They are doubtful they will finish, doubtful they are running enough, doubtful they will be fast enough to make the cut-off, doubtful that they can even make it thru next week’s run because the run this week went so poorly. I’m want ALL OF YOU to know that you will make it thru the next run, and the one after that, and the 20 miler. We will get your nutrition in check and find out what works for YOU in order to get you to the start line with nervous excitement rather than doubtful dread. You are certainly not alone when you look around and wonder if you are going to make it thru the training. This is absolutely normal! At this point, you are starting to hit the high miles and it’s not easy. I remember getting back into my car after many a long run wondering how I could possibly get thru the next bump in miles. Yet, I did it, each and every time. It doesn’t get easier when you have more marathons under your belt, you just know to trust the training plan. Trust the training plan YOU picked. Think about it for a minute, you picked a plan for a variety of reasons but basically because you thought it was “somewhat” manageable for your life. You probably downloaded it from the internet, right? How many other people have used that same plan before you? You probably downloaded a plan from a well know website, right? How do you think that person or that website got so popular? Well, it wasn’t because the people who ran the plan before you didn’t make it thru the training, couldn’t manage the next bump in mileage, didn’t finish their race. They did finish and so will you! If you are having excessive soreness & fatigue after the long run, consider an ice bath. Nobody wants to take one but they do help. It is the fastest way to cool the muscles and decrease swelling. Everyone does it differently but I sit in the empty tub, start the cold water, plug the tub and immediately dump in the ice. I use a lot of ice, a heaping full 8×8 pan, no less. Let the tub fill to the top of your hip bones and sit for as long as you can. I usually shoot for 15 minutes between fill time & sit time. I take my phone, check Facebook, brag about my AWESOME long run, let everyone know I didn’t die, send out a few tweets about how my training partners totally ROCKED THE RUN, etc. Basically be prepared to distract yourself from the cold water. Don’t forget to use a Post Workout Recovery Drink that helps you get back your lost nutrients immediately after the run. If your “on the run” nutrition plan is not working, change it. Now is the time to nail down what works for you. Remember that what works for Suzy may not work for you, so talk to several people to get various ideas. Keep trying, you’ll figure it out! If all else fails, keep things very bland both the night before and the morning of the long run. I like to keep it simple with a bland pasta dish with very little protein or fiber the night before, then a banana in the morning of the run. Consider getting up a few minutes early to drink a cup of coffee or have an energy drink that will get your blood and intestines “flowing” pre-run. This could help avert an awkward run into the bushes for an emergency pit stop! Weather makes a difference! By this point in the summer, you have probably realized that when it’s really hot out, its just not safe to run your normal pace. In addition to adjusting pace, you will need to adjust your fluid intake. Consider a hydration belt, handheld or hydro pack and plan ahead to drop water along your route. Buddy up for the water drop and run so that you will have various places where you can expect icy cold water without having to do all the drops yourself! I would also recommend dropping more than you need in case another runner, who is not as well prepared, needs to “borrow” some of your supply. If you see this cooler on the trail, help yourself; I always bring extra! Know that the higher temps and high humidity will result in more sweating. The sweat flushes salt out of your system so go a little heavier on the salty foods the day before the long run. Consider salty snacks, salt tabs, electrolyte drinks or a salt packet on long runs/race day to put a little salt back in your body to avoid water poisoning. Know that you and Suzy probably aren’t using the same training plan, so don’t go out and run 10 miles with her because that is what she has on her schedule. Commit to the plan you picked and DO NOT feel guilty. You will both be standing in front of the same finishers screen wearing the same shiny new medal! Don’t stress; “You’ve Totally Got This”! Do you have a specific training issue/question? If so, comment below and the readers will try to help you out! If you have any training tips that can help calm the nerves of our beginner marathoners, I’d appreciate your sharing! This entry was posted in Running and tagged AdvoCare, AdvoCare Post Workout Recovery Drink, AdvoCare Spark, Marathon Training, marathon training plans, marathon training tips, Trust in your training by tootallfritz. Bookmark the permalink. Can you text me Suzy’s number?? THIS IS IN AWESOME POST and it is like you were reading my mind. I have been feeling exactly all those doubts about future weeks’ long runs and finishing the marathon. THANK YOU for the assurances and the confidence booster. I am going to save this post to re-read every time I need some mental support!!! Relax, you will do great! Have fun! obviously, you have been reading my mind…. you must also be peeking at me in the bushes! I know you aren’t actually reading my mind — since I just email you and bother you every time that I feel insecure and need a pep talk! (Which is all too often. Sorry about that!) But it is good to know that there are (many) others who have the same self-doubt and lack of confidence. I do get overwhelmed hearing from friends who have run longer, farther, faster than me. I’m proud of them — even happy for them — but I have to realize that we all have different levels of committment, athletic backgrounds, and goals. The higer mileage is kicking in, so I really feel like training has suddenly started. Can I do my miles this week? Of course I can! Will it be easy? Of course not! And those inner demons sure do like to come out every once in a while just to make sure that I realize this isn’t an easy goal. But once I can achieve it, no one can ever take it away! Thank you, Amanda, and all of the other F’N Runners for being supportive and encouraging! I’m training for my first full, and took an unplanned week off. Queue all the thoughts of doubt and negativity from not knowing where to pick up in the training plan! This was perfectly timed since I’m the solo runner in our household and it can be too easy to give in to stupid thinking and not trust my training. Pick up as scheduled & pretend you didn’t miss a week. Crossing my fingers that you missed a cutback week! You’ll,be fine regardless. Keep in mind, we don’t get paid to run so we just have to do the best we can with what life throws us. No big deal, right? My new pre run meal – I run at 6am, and I refuse to get up any earlier than 5:30 to make that happen, so fueling a long run was becoming an issue. However, upon contacting my nutrition support person she suggested 4oz of ground turkey, 2/3cup cucumber slices and 1/4 of an avacado at 10pm the night before. To say that I was skeptical is quite an understatment! That said, I ran 9 miles (2 miles further than last week) felt great the whole time, got home drank an Advocare Post Workout Recovery Shake (see Amanda for one of these) 20min in an ice bath and never felt better after ANY run. What a difference proper nutrition makes, it is worth the time to plan it out. Thanks for that awesome 10pm snack tip! And great run! That’s something I may have to try! It sounds pretty solid. I run at 6:30 on Saturdays for my long run, and have found that waking up early enough to eat my toast, then getting back in bed until I “actually” need to wake up, works well for me. I eat about 2 hours before my run, even though I only need 1/2 hour of contacts/clothes/etc prep. Ahh…doubts….concerns that one cannot run the upcoming marathon? I know this feeling well from years ago when training for my first marathon, the 2007 Chicago Marathon. And the feeling was experienced again with subsequent marathons. Now after running 22-marathons, running Boston 4-times and being a RRCA certified marathon coach, I don’t worry so much anymore…only just about how fast I will be able to run the target marathon. I know I can finish it….it is just a question of how much time and how consistent I can be in my effort. But Too-Tall-Fritz is correct to fall back with faith on your training. The runs don’t always go well, nor do you always finish the runs, especially the long runs, feeling strong and capable of doing more…..often just satisfaction and relief you got the mileage done and in the training log book. If I can offer any consolation, I can tell you I experience these feelings all the time, but I always maintain faith that if I stick to the training, make the adjustments where necessary, and make it to and correctly train and recover through that taper, I usually make it to the Start line feeling good and ready to tackle marathon distance and usually come close to or exceed my race goal. So…if you are a newbie or a first or second time marathoner and experiencing the doubts, then you simply follow the advice TTF posts….have faith in your training. The purpose of those training runs, both the shorter mid-week running and those mega-long runs on Sats or Suns is to prepare you to run marathon distance. Those schedules are proven by success of hundreds of thousands of runners before you. As a marathoner and a marathon coach I understand the principles of training and what it is supposed to nurture in terms of physical and physiological adaptations that make you better and more efficient in running, and building the aerobic and endurance capacity to cover marathon distance. That training road is never easy…progressively longer runs that test both your physical and mental abilities. But if you have run some of those long-runs and ended up feeling like the walking-dead or hearing your brain question your sanity and casting doubt on your ability to run 26..2 miles, then as a Coach I would say the training is working. Training is progressive….progressive in the sense of progressively stressing the body, allowing rest and recovery to rebuild, and the body responds by supercompensating in rebuiliding muscle, joints and other tissue, as well as increasing glycogen storage, enzyme and metabolic capacity. The stress and the fatigue is necessary to give the body the cue to get stronger and better. That in a nutshell is what the training is all about…..stress/fatigue…rest/rebuild….adapt and run stronger….repeat the process over the 15-weeks until taper. Then the taper period will come where total weekly mileage and long-run mileage will reduce dramatically over the 3-weeks until race day. You will still be doing running during the week and far shorter long-runs on the weekends. You will still be doing some pace running and sometimes even faster running routines over short distances if you are a more advanced runner. 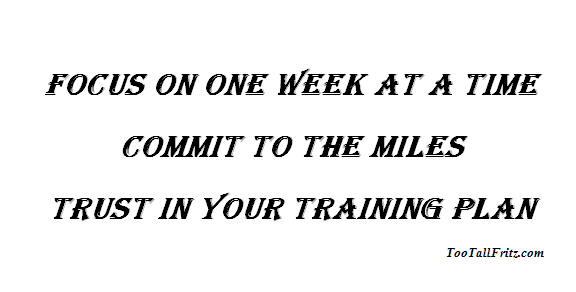 But after all those weeks of building up long-run and weekly mileage and stressing the body to its limits, once you reduce that training mileage in the taper the body should respond quite nicely with super-compensation in rebuilding muscle and other tissue, stockpiling glycogen and enzymes for metabolic production of energy and you should feel it. Not right away. The first week of taper you may still have doubts, but well into the 2nd week and definitely by start of 3rd week of taper, you should start feeling the effects and rearing to run a marathon! If you have done your training consistently and too its specific goals and objectives for each run, and have remained injury free or at least have them subdued, then chances are you should one day during that week before the marathon experience what I call “Light & Bouncy.” You go out for a run and after the first mile the feet fall into sync and hit and bound off effortlessly and you feel lots of energy….so much that you can run a lot faster, but you hold back cause you know you need to save that for race day. So…just as TTF says…maintain Faith. Stick to your training…stick to your post-run recovery and cross-training routines…work out your hydration schema and your race plan and reace hydration strategy. Everything else falls into place. And don’t forget there are a lot of others out there with the same goal as you…to run a marathon. So take advantage of that and ask questions or ask for help out there on the course. Most marathoners back there in your place in the pack will gladly give you advice or assistance. We are all out there together…just some ahead and some behind. When you run a marathon….you run it simply one mile at a time….one foot in front of the other. Never a thought of how long the distance is….just get to the next mile marker or the next water stop….that’s all. You can do this….if you do the training…..you can do it! It is almost as if you read my mind when you wrote this entry. Thank you so much for your encouraging words if advice. I am open to suggestions for “on the run” nutrition/energy. I am not a fan of Gu and Jelly Beans don’t seem to do anything for me? Anyone have other recommendations? I’m sure Amanda’s got her own thoughts, but I’ve found some other things that work well for me: Clif Shot Blocks (gummy chews) were my fav last year, and this year I’ve been enjoying Accel- based nutrition. Their drink Accelerade has helped me not want as many gels/blocks, and their gels (Accel Gel) are actually a lot thinner than the Gus/Clif Shots I’ve tried in the past. My main recommendation, rather than a particular brand, would be to try a variety of different things on your shorter runs. You don’t necessarily need the extra energy, but can test out which taste best and are best for your stomach. Just go to your running store or REI and pick up a few of different brands and flavors. I like Clif Shots and Clif Shot Bloks, and Honey Stinger gummies (haven’t tried their gels yet). Lately I’ve been looking into “real” food to eat during runs. So far I’ve tried Fig Newtons and it’s worked well. I’m planning to try pretzels during my next long run. Other suggestions have been orange slices, dried figs, honey, pieces of a cut-up PB&J sandwich. I knew a woman who would eat m&m’s for the entire marathon. I knew another lady that cut up snicker bars for her fuel. Smart ladies! LOL! Before AdvoCare had the Rehydrate Gel, I used FRS Chews. Two chews are equivalent to 1 gel, so I could split up my intake. I would do 1 chew at a time to keep fueling but in a lower dose than a full gel pack. The chews are tasty and small so it’s like chewing up a starburst. Worked very well for me. I also don’t mind the Hammer Gels because they are thinner too. For me, carrying the shot blocks and beans, while they taste good, it’s too cumbersome for me to carry, so I stick with the gels or chews. Keep trying, you’ll find something! Awesome post. Maybe I should bookmark this and read it each week until the big race day. It’s only natural to feel doubt- that doubt can be useful as motivation. Excellent advice all around.